Oh what fun. We went to the Kane County Flea Market this past weekend. I had to walk away from many a chair (my collection is up in the 30’s). 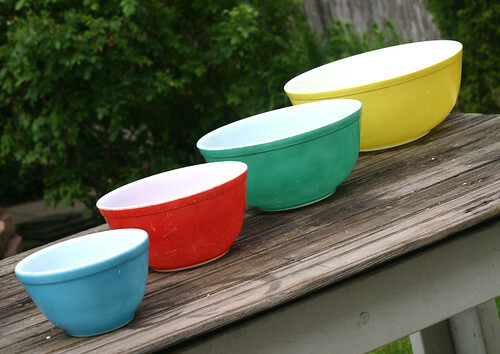 Instead I told John that we might be able to find an old set of mixing bowls we grew up with. After explaining what the bowls looked like and the recipe I had for Bread Pudding that uses a “yellow bowl” – low and behold we found a FULL set with no missing bowls – what luck! 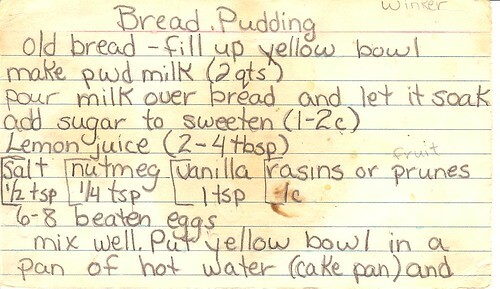 Kevin should get a big kick out of this because, as I recall, he was the number one bread pudding inhaler! Remember that bread drawer full of old stale and sometimes moldy bread ends. I had to go over the writing because the scanner wasn’t picking up the old pencil. 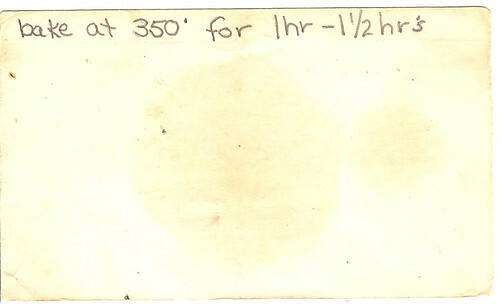 That recipe card must be thirty years old. Look how yellow it is! Powdered milk….can you believe it??? That was THE BEST way to use every last crumb of bread….and no, we didn’t use any moldy crusts…. That recipe called for cream instead of powdered milk and had a brandy sauce topped with Frangelica whipped cream. Heavenly! I only have my Mom’s old and worn yellow bowl. Thank you for the pictures. I remember the blue one for some reason. I’m so glad you adopted them. In our family the Yellow Bowl was for Homemade cooked from scratch Banana Pudding with Vanilla Wafers. The Green usually held mashed potatoes at dinner unless it was a holiday- then yellow. The red lots of fruit and the blue- pork n beans…..
Oh no – thank YOU Lillianne and Cheryl for stopping by and sharing your memories! I went on ebay and found a couple of full sets – go figure! There’s also a pyrex website dedicated to “retired” pyrex vessels.